Granularity characteristics of crushing product depend on the nature of being crushed material, the first is hardness. 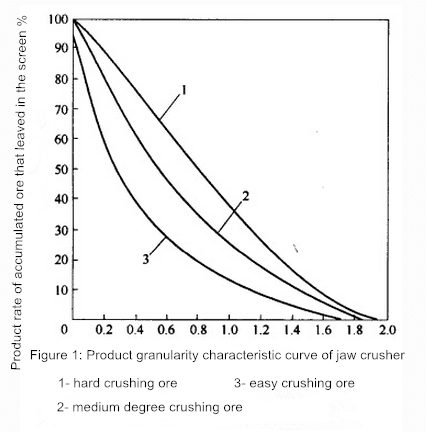 Product granularity curve that reflects not only the performance of the crusher and product features under the width of discharge opening, but also provides a reliable basis for the adjustment of the discharge opening. It is very useful to such relative size as curve(ratio value of particle size and discharge opening). From the curve, can find out the largest particle size and the content that greater than granularity of discharge opening (residual percentage), can get production rate under any particle size and the particle size under production rate, can also confirmed the discharge opening size according to the rate of process requirements. There are three types of granularity characteristic curve shown in figure. Shall can use these three kinds of typical granularity characteristic curve without the actual data. 1. During the machine running, should take the timing circuit to check the working condition and bearing temperature of parts. For the sliding bearing of large type of jaw crusher, usually bearing temperature shall not exceed 60 ℃. 2. Crusher stopped should be carried out in accordance with the production process in order. Firstly must stop feeding, after the ore discharge out from crushing chamber, then stop the machine and belt conveyor. When crusher is stationary, should stop the oil pump motor. 3. Should be noted that the crusher suddenly stop, before the accidents finished and ready to start, must remove the accumulated ore from crushing chamber, then start running. 4. In order to ensure the normal running of the machine, the personnel that not familiar with operation procedure NOT allowed to operate the crusher individually.